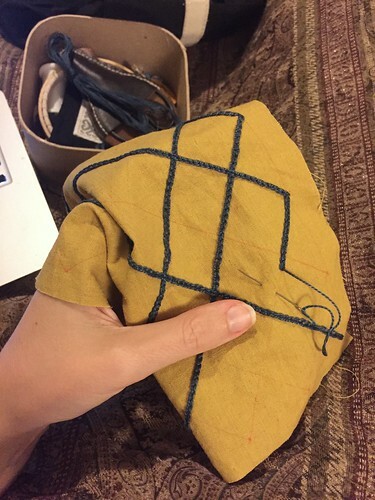 When last we left our project, I’d finished up the embroidery on the first pouch, and I’d sketched out the diamonds on the yellow linen (the last of the linen from my Byzantine dress [have I seriously not blogged that either?! What is WRONG with me? ], except for what I’ve held back for lining the cuffs, whenever they get finished). 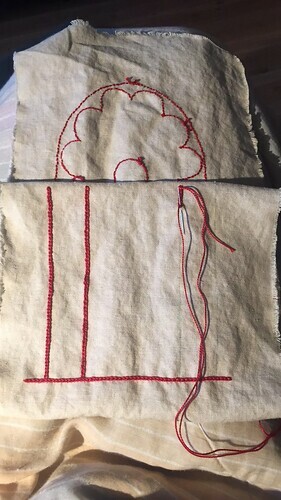 Digression aside, I basically marked equal spaces along each edge and connected them, leaving me with a lovely diamond grid to embroider. 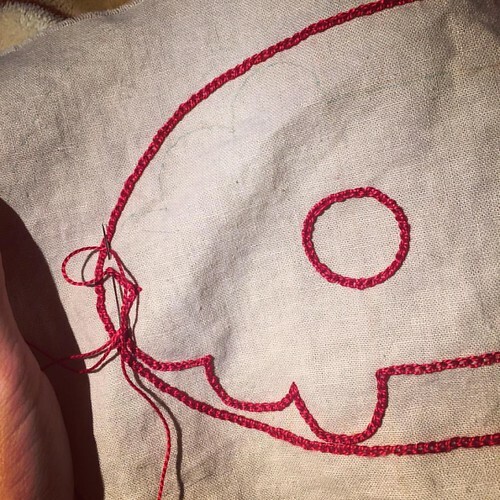 I only did one line of chain stitch. Since the overall motif was much denser than the other pouch, I didn’t think it needed bolder lines. Here it is all finished, ready to be sewn up. 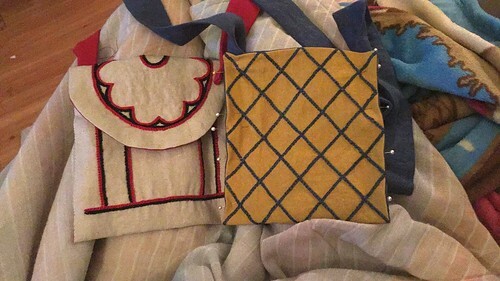 I lined both pouches (but forgot the take pictures) with coordinating linen by laying the pieces right sides together and machine sewing at the seam allowances. 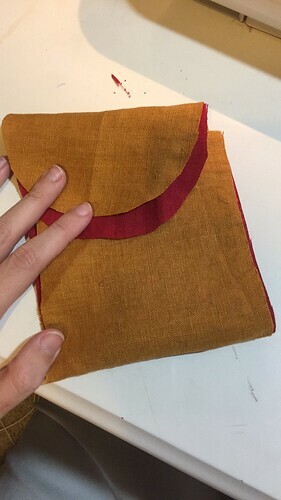 I clipped the curve of the cover flap and then turned them right side out and pressed, not unlike the Double Eagle Pouch I made some time ago. But that braided finish is a pain in the neck, and I kind of hate doing it, no matter how fantastic it looks. 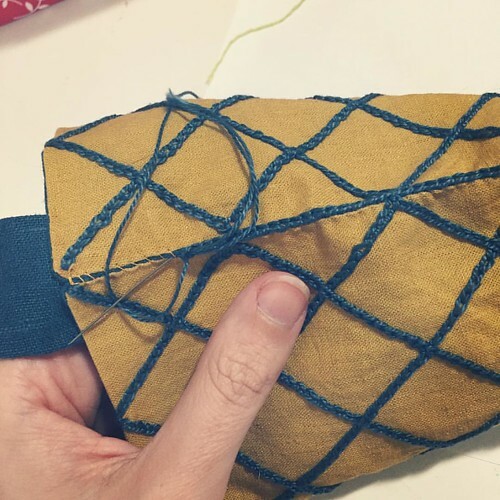 So instead, what I decided to so was whipstitch the pouches closed with a thread that matches the outer fabric, so as not to be so noticeable, and then just do a decorative chainstitch along the edges of the join, to mimic the braid stitch without all the fuss. I did this on the dragon pouch too (technically after these were done, but I did blog that one first), because I really liked the effect. 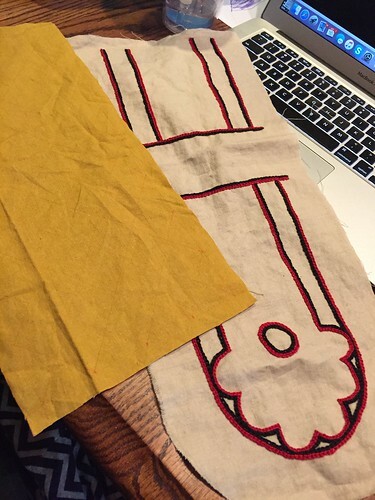 I added long shoulder straps in the lining fabric, as shown in the manuscripts. The strap ends were doubled over to create a smaller footprint when attached to the pouches. 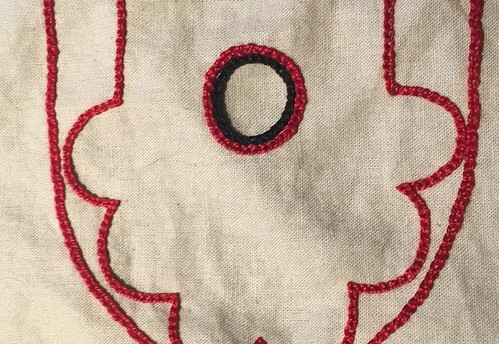 The red ones were sewn to the back, and the blue ones were inserted into the pouch and sewn to the lining. I’m really pleased with the way they came out and I want to make a million more of them. 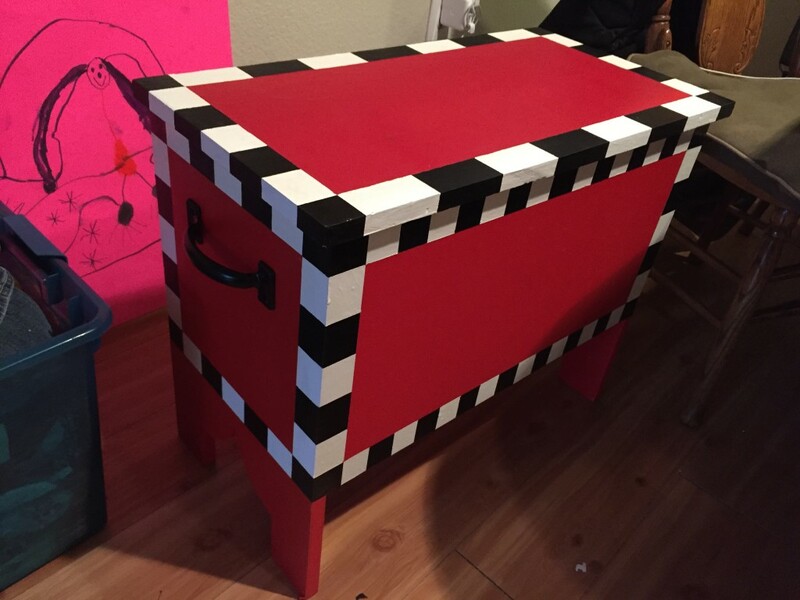 And the chest that Juan Carlos made for me? It’s beautiful! For a while now, I’ve been wanting a six board chest, in which to keep my feast gear and other sundries at events. I have resigned to myself to the fact that I don’t have time to do all the things I want to do. And even more importantly, I don’t have to do the things I don’t have any interest in doing, even when the outcome of those activities is a thing I want or need. I am not a wood worker, and I don’t really want to cultivate those skills right now. So I put out a call-out to my reenactment friends, to see if any of them would be interested in doing an artisan trade. And one like the yellow ones below, with no flap and a diamond design. 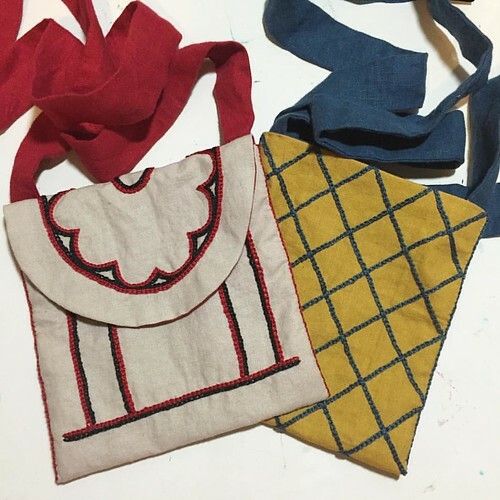 I picked out my colors (red and black on natural linen, and indigo blue on yellow) and sketched out my designs on the fabric. I decided to go with DMC Pearl Cotton, since I have a metric ton of it, it launders well (I try not to use delicate fibers unless I know who they are going to), and makes a nice bold clean line. I decided on chain stitch, as it makes the boldest line with a single row of stitching, and the designs are all linear. 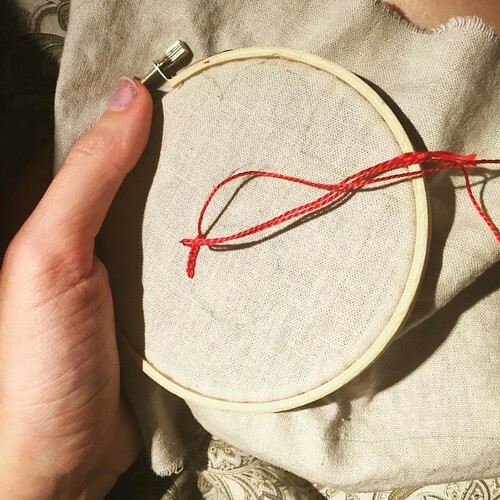 I also started off using a hoop, but gave it up as I found it was more trouble than it was worth. 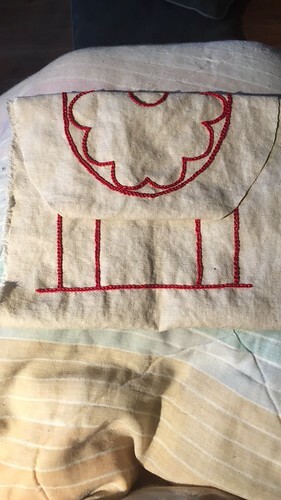 This red and black design has the flap motif incorporated into the back; the pouch flap will fold over at the top of that line, halfway through the circle. The pouch laid out, so you can see basically what it will look like when it’s all folded up. I finished up all the red, and then began the black, just embroidering another line right next to the one that had already been done. I really like how they look together; so bold and graphic. All finished up with the first embroidery, about to start on the second. 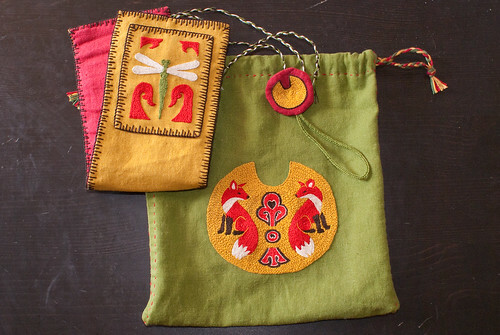 Part two will be the second pouch embroidery and how I made them all up. Tune in Monday! A friend of mine, Mariana, gave me a whole bunch of her old garb. Which is so sweet, but seeing as she’s more than half a foot shorter than me, there needed to be some modifications made. This particular piece, a Spanish bliaut, is a lovely shade of sea-glass green, with navy blue velvet ribbon trim. I had some linen I had dyed a soft dusty rose pink, and decided to use it as a guard on the bottom, and to make arm bands to tie in that color to the rest of the dress. I centered some leftover velvet ribbon in the bands as well, for some added visual interest. You can also catch a glimpse of the pink cord I finger looped for the side lacing too. 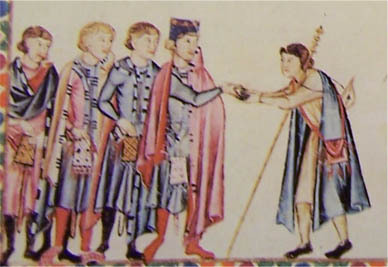 This picture is ridiculously orange, but you can see the drape of the guard. It doesn’t follow the flare of the dress, but instead hangs straight down from the hem, so it looks funny hanging like that, but it’s not something that’s terribly noticeable when I’m wearing it. 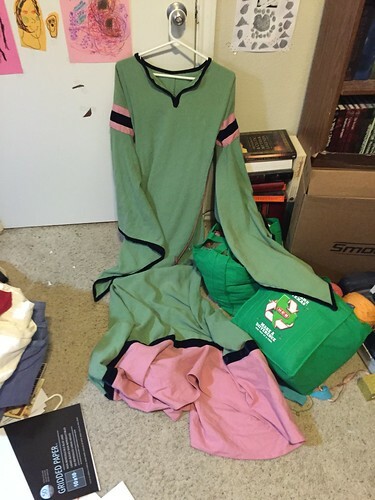 Here the colors are truer, and you get a glimpse into the wreckage that is my work room. The bags are gone; I’d just culled my yarn stash and they were waiting to go away, and the rest of the detritus has been put away. 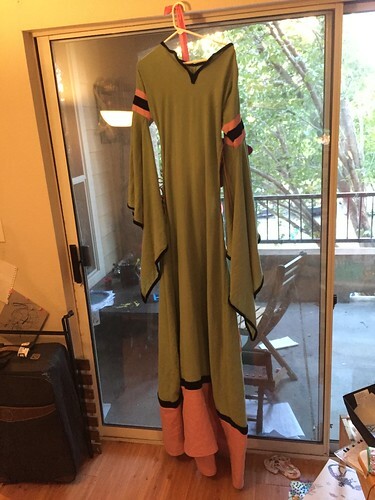 I’ll try to get some pictures of me wearing it soon. Sometimes life throws a curveball. 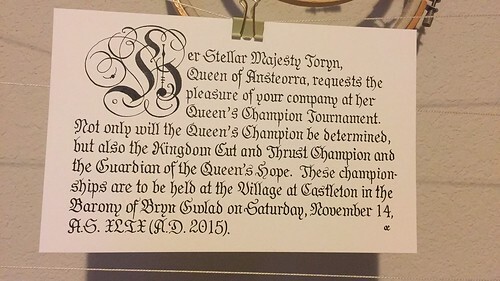 Not to me, this time, but to the lady who was meant to make the invitations to our most recent Queen’s Champion event. The steward of the event, my sweet friend Marie, texted me to ask if there was any way I could make invitations in the four days before they needed to go out. So I sat down at my wonderfully medieval computer and whipped up a calligraphy template (with decorative cadel!) in photoshop, and used it as a guide for the final piece. I think it came out well, for a last-minute day’s work. This weekend, and next week, I am from home on a trip. 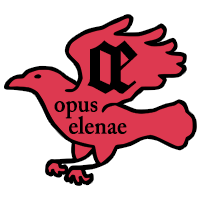 I hesitate to call it a vacation, as we are, this weekend, in Maryland for Edmund’s grandmother’s funeral (ave, Atlantia!). Next week we will be back on schedule for happy Thanksgiving visitation plans though, which should be more joyous. One of the things I wanted to work on this year was the creation of some more foundational pieces for my wardrobe. Would you believe I only have one pair of hose? So on Monday, gearing up for a week and a half absence, I cut out two pairs of linen hose to handsew on the trip. 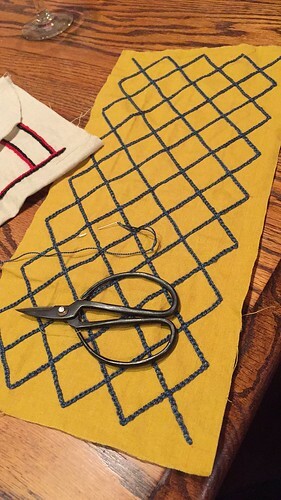 Yeah, I’ve also had the hand sewing bug lately. I was going to make a woolen hood for a friend, but I didn’t have enough fabric. It will show up as a pair of warm sleeves instead, embroidered with some of the woolen embroidery thread I hand-dyed a while ago. The first is this pair of lovely crimson hose (the other is a pair of tawny-ginger colored ones). 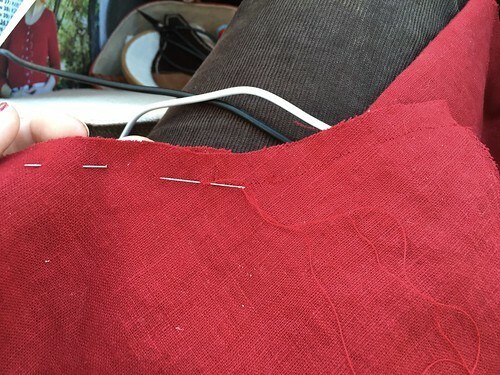 I am sewing the long seams with a tiny backstitch for quickness and strength. 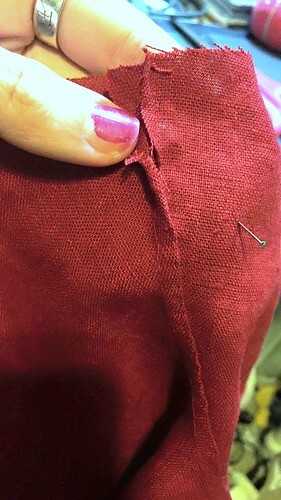 Believe it or not, it’s actually just as quick for me to sew backstitch as running, and I find it’s a sturdier seam. 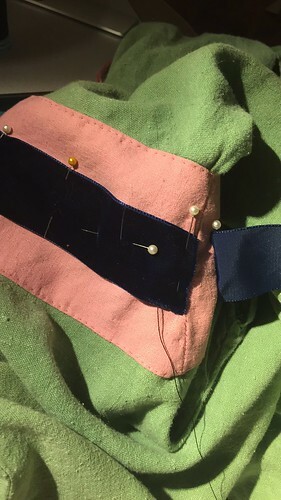 I’m using Gutermann silk sewing thread and a short, skinny quilting between for a needle. 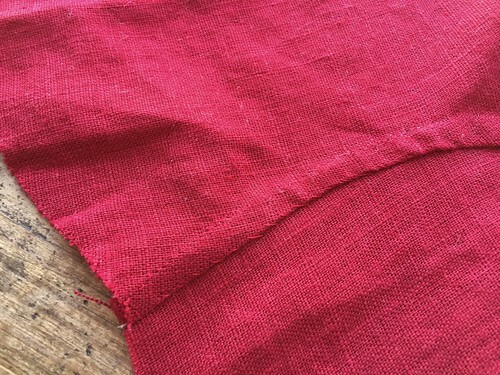 When the seams are finished, I flat fell them to keep the raw edges of the linen from unraveling. 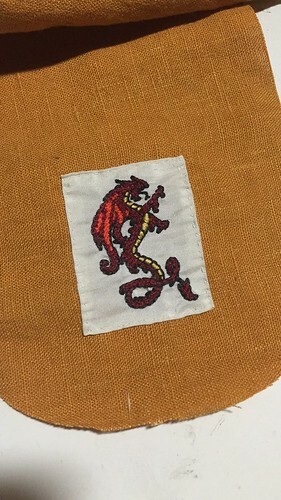 Having had a doublet I made completely fray apart at the seams, I am fanatical now about finishing techniques. 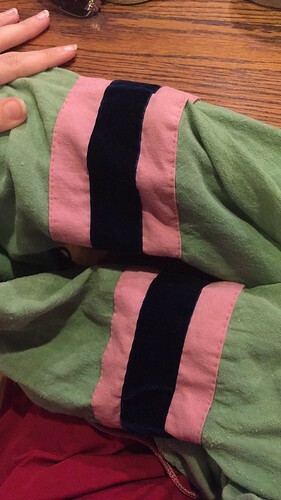 I cut one side of the seam allowance down by half, and fold the taller side over it, and then fold flat and whip stitch it down. It makes for a really sturdy, strong seam. 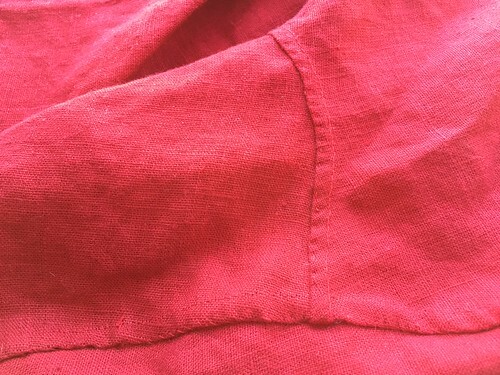 The linen, cut on the bias, makes for a lovely flat seam, even along curved seams like the instep. 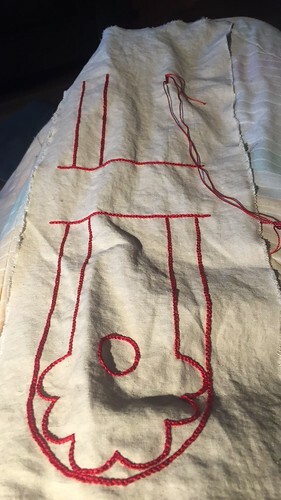 I mistakenly managed to flat fell one of the seams so that the “ugly” side of the backstitch shows, but I don’t think it’s going to structurally impact the way the hosen wears, so I’m not worried about it. 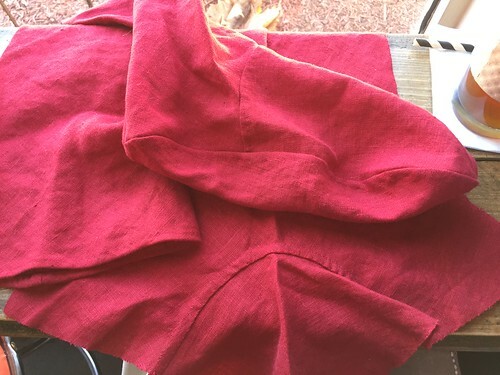 I’ve managed to finish one of the hosen so far (The top is hemmed with a running stitch; I forgot to grab a picture of it), and I’m looking forward to working on the next. I think my favorite part about these hose is that, combined with those garters I wove a while ago (that first picture shows the only other pair of hose I have, incidentally), they’re my colors! This was for a Sable Swap a couple years ago. 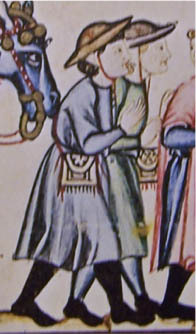 The recipient was an embroiderer and had a Kievan Rus persona. I know what it’s like to never have pretty things for oneself, after giving them all away. So I wanted to make a little kit that was relevant and useful and pretty. 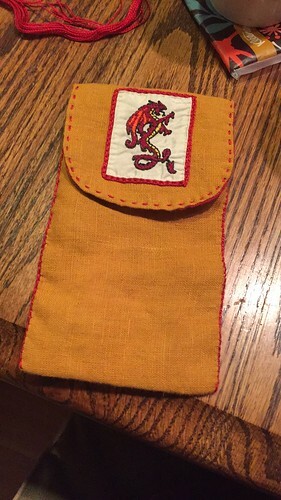 It consists of a pouch, a needle roll, and a scissors fob. The design for the pouch was taken from Kievan temple-brooches from the relevant period. Most of them show animals or saints mirrored. 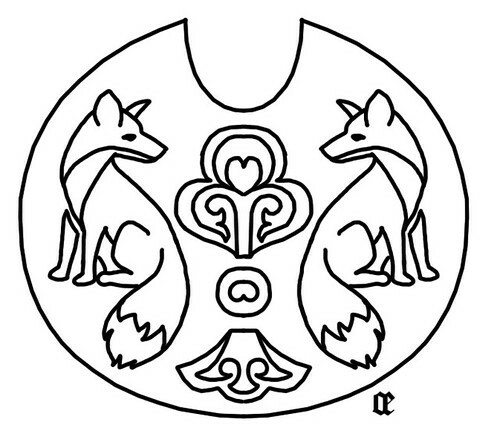 I went with foxes, since the recipient listed those as favorites. Embroidered in split and chain stitch with DMC cotton floss. 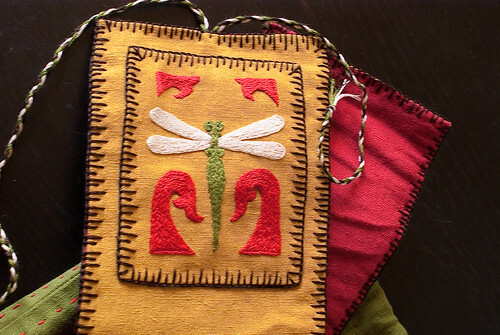 The needle roll was embroidered with a dragonfly (also a favorite) and some Kievan motifs to tie them in together, with a blanket stitch in varying long and short lengths to be a decorative finish. 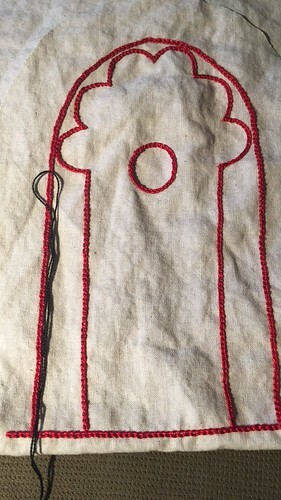 The scissors fob echoes the shape of the temple brooches, and has a lucet cord loop to attach to the scissors. So. Now that that’s done, even though I didn’t necessarily intend to do a project recap in this post, let me show you why I DID want to write today. 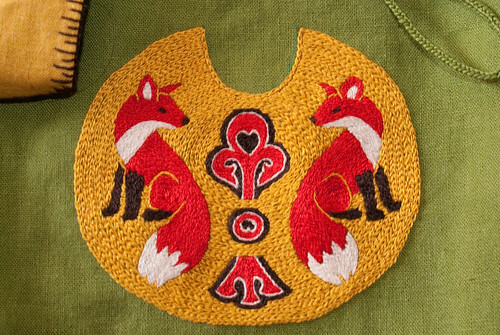 I finally cleaned up the fox brooch motif. A few people have asked for it, and I’ve forgotten about it multiple times. So here it is! Enjoy! Ave, everyone! I know, it’s been a bit since I’ve written. Life got busy. But I thought I’d take a minute and post about a little collaboration project I did with my friend Lia. Our local Barony had its fall event over Halloween weekend. One of the fun things that happened was that every fighter that wished to compete int he Championship tourney had to be sponsored by an artisan, who was in turn required to make a small thing to add to the prize baskets. Lia enjoys embroidery and she and I agreed to collaborate to sponsor a fighter with an embroidered belt pouch. 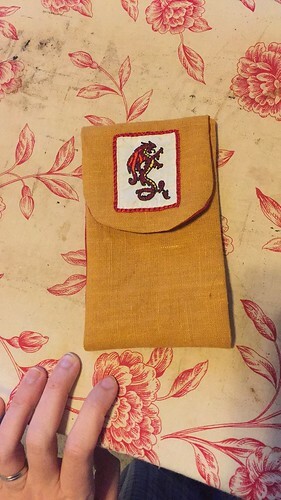 She told me in advance how big the dragon would be (about 1.5×2.5 inches) and I didn’t want the pouch to overwhelm the tiny embroidery, so I decided to make it the perfect size to hold a cell phone on a belt. I know many people have issues with modern tech being visible, but I know too many people who NEED to have them handy. My friend Helene uses her mobile to monitor her diabetic son’s blood sugar levels. 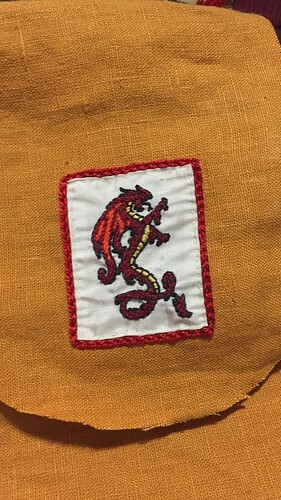 I measured some linen in coordinating colors against my own phone, leaving a rounded fold-over flap , and then appliquéd the embroidered dragon to the outer layer. And finished off the edges with a quick chain stitch border. Then I sewed the outer fabric and lining together with right sides facing each other, and turned the pouch right side out, and ironed everything. Oh gosh, I need a new ironing board cover. At this point, I also added a loop on the back to thread the belt through. I forgot to take pictures of it, but it’s a very simple belt loop. 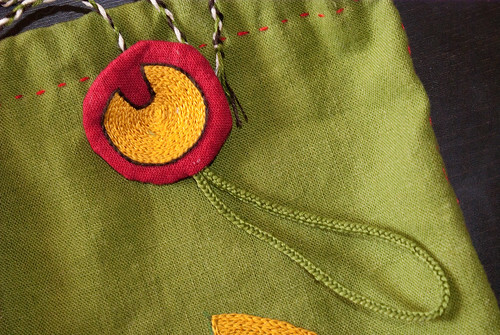 I whip stitched the edges of the pouch together, and then finished it with a chain stitch along the side. The inner edge and the flap were finished with a simple running stitch. Et voila, a lovely cell phone belt pouch. I liked collaborating with Lia on it, and I am excited to do some more joint projects in the future.